Treasure Island debuts tonight on Syfy at 7 p.m. Eastern. Treasure Island is far more exciting on the page than on screen, at least when taken in full instead of pared down and streamlined for a three-act structure. Through the eyes of the young first-time sailor Jim Hawkins, the book is full of discovery at every turn, the origin of the modern pirate story. But long-winded introspection and constant flashbacks don’t work as well in a filmed adaptation as they do in Robert Louis Stevenson’s novel. So why then, are there more than 50 adaptations of the classic tale, either in theatrical releases or television films? Long John Silver is an iconic character, with his crutch and a parrot on his shoulder, and the search-for-treasure story never fails to intrigue. But in order to make a genuinely compelling seafaring film, merely trotting through the paces isn’t enough. SyFy’s new adaptation of Treasure Island is one of these plodding, uninspired jaunts through familiar material. The Pirates of the Caribbean series blended in supernatural elements and broadened the scope of the story to not only include romance, but visually striking epic battle sequences. Muppet Treasure Island pumped the story full of humor, Disney’s Treasure Planet cut the story with science fiction, and the story even shows up in an extended sequence of The Pagemaster with other classic literary tales. In any case, most of the adaptations of Treasure Island condense the events of the novel, which are wide and disperate, slowing down the story to provide atmosphere and a more detailed cast of characters. The problem on film is that kind of detail for country doctors, semi-influential figures of nobility, and various interchangeable pirates, the detail is unnecessary in light of an infamous treasure hunt. But that didn’t stop SyFy from making this version a potential mini-series, with a running time of nearly three hours. That’s a lot of space to fill, and without the first-person perspective of Jim leading the way through all the various side stories, Treasure Island settles into boredom quickly, meandering at a glacial pace through mutinous developments and character shifts that could have used a punch-up at the script level. It doesn’t help that this adaptation feels and looks incredibly cheap. There’s no need for much in the way of effects work, but the editing is shoddy and the camerawork lazy, settling for merely laying a scene instead of finding some kind of distinct style. The story is ingrained in pop culture so heavily that summarizing it feels pointless, but the first hour focuses mainly on set dressing, relentlessly introducing and re-introducing characters as Jim Hawkins slowly puts together the pieces that lead to the voyage for treasure. If there’s a bit of praise for this adaptation, it goes to Eddie Izzard. 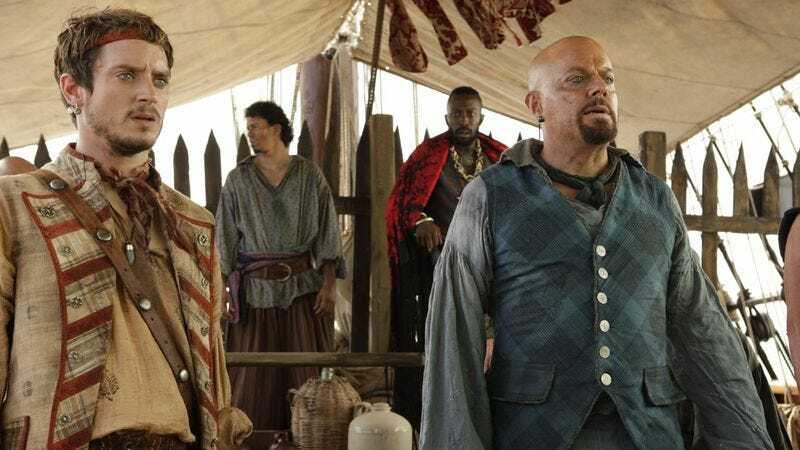 While I’d still nominate Tim Curry’s wonderfully silly performance in Muppet Treasure Island as the best Long John Silver on screen, Izzard acquits himself well with the material. He hits the right blend of witty father-figure to Jim and conniving, bitter pirate. I’m a fan of Izzard’s standup work, as well as his others roles in The Riches and Ocean’s series, but this performance is somewhere between his manic comedy and slower dramatic work. He gets most of the best lines, tossed in with more than a few clunkers as he sits on the sidelines of the main fight sequence in the film. The fight choreography is worthy of community theatre, making the moments that should be filled with the most tension feel droll and unintentionally funny. The other top-billed talent barely makes an appearance. Donald Sutherland pops in an out for about five minutes in the entire three hours as Captain Flint, the insane pirate captain whose treasure everyone seeks. Elijah Wood gets to run around, act crazy, and demand cheese as Ben Gunn, a former Flint crew member marooned on Treasure Island. Neither of these performances add anything much to the film, and changing the ending of Ben Gunn’s story from the novel seems unnecessary at best and horribly misguided and half-assed at worst. The film pads out the running time even further with a pointless subplot involving Jim’s mother, Silver’s female companion, and the fate of the Hawkins’ inn. The ending is also altered, giving Long John Silver a potentially different fate, preserving Ben Gunn in his crazed habitat, and even the fate of the titular treasure finds a different final resting place. Those modifications feel like scrambling for some kind of distinction among all the other adaptations, but they’re bland, middling changes that don’t affect the themes of the work or reframe any part of the story in a new light. By airing the entire film in one night, it appears that SyFy is just burning off a failed risk and minimizing the damage. Eddie Izzard makes the film at least watchable, but any fan of the Robert Lous Stevenson novel, or any fan of pirate tales would be better off renting the Muppets’ version instead and re-watching it with some friends.